A WebFOCUS environment consists of a web server, a WebFOCUS Client, and Reporting Servers. 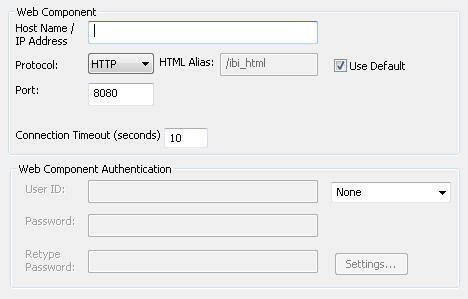 To add a WebFOCUS environment, you specify a web server that includes host name and port number. The HTML alias/context root is needed for Developer Studio to access the WebFOCUS Client to determine if the environment is available and retrieve basic information, such as release information. Depending on the web server authentication, information may need to be provided in the Web Authentication component. Depending on the security configuration of WebFOCUS the Developer Studio user may to sign in so user permissions can be validated, or sign on will be used to access information that is secured, such as the Reporting Servers. You can add new WebFOCUS environments and edit existing environments in Developer Studio using the WebFOCUS Environment Properties dialog box. This lets you create and manage environments, such as development, test, and production instances. An environment can be on the same machine as Developer Studio or elsewhere in your enterprise. One environment can be set as the development environment and is used in the Projects area of Developer Studio. By default, Project-based development is done on the local machine (localhost). Once a WebFOCUS environment is defined, you can tell Developer Studio to perform Project-based development on a remote machine instead of localhost. Note: An environment can be set as the Development Environment if its configuration allows project development. Is your logged on Windows ID. This file and directory may not be visible by default. To see this directory, open Windows Explorer, click Tools, choose Folder Options, and select the View tab. Then, select Show hidden files and folders and click OK. If an existing wfscom.xml existed and had a localhost environment, the existing localhost environment gets updated with settings based on the installation and configuration options selected during the installation. If localhost did not exist, it is created with settings based on the installation and configuration options selected during installation. If file wfcom.xml is removed, a new file with default settings for "localhost" environment will get created when Developer Studio restarts. User IDs and passwords stored in wfscom.xml are encrypted to keep them confidential. 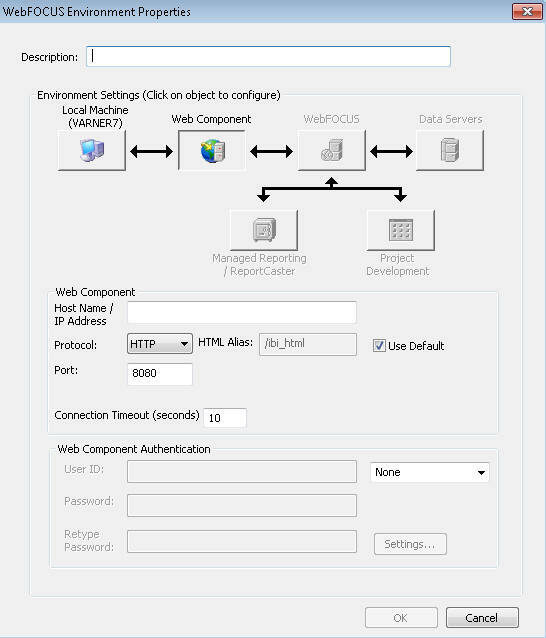 WebFOCUS environment properties apply to your current Developer Studio configuration. It will not impact other users or the WebFOCUS configuration. Select the File menu and choose Show Environments. The Environments List dialog box opens, as shown in the following image. This dialog box lists all WebFOCUS Environments defined for Developer Studio. If you previously installed Developer Studio, WebFOCUS Environments may already be defined. Otherwise, only the localhost environment appears. To edit an existing environment, click Properties. Tip: You can also add a WebFOCUS Environment by right-clicking WebFOCUS Environments on the Developer Studio Explorer and selecting Add. An environment can be set as the Development Environment if its configuration allows project development. The WebFOCUS Environment Properties dialog box opens, as shown in the following image. At the top part of the dialog box is the Description text box followed by the Environment Settings section, which contains a series of buttons that each represents a component in a WebFOCUS environment. At the bottom part of the dialog box are fields to set up a connection to the web server (Host Name, Protocol, Port, and options to set if Web Authentication is used). Use the WebFOCUS Environment Properties dialog box to define which components make up the environment. You can optionally enter authentication information for components that require logon credentials. On the top of the window, type a Description for the WebFOCUS environment. This description will appear in the Developer Studio Explorer under WebFOCUS Environments. The following image shows the top area of this screen. This area contains a series of buttons that each represents a component in a WebFOCUS environment. The Web Components button is selected by default. The Project Development button is only available in the full edition of Developer Studio. Note: The description cannot contain special characters, such as ., /, \, ?, *, and others. A message with characters not allowed will display if one of the restricted characters is detected during validation. On the bottom of the Web Components page, specify the information needed to access the web server. For some environments, once you specify the web server, all other settings default. If the WebFOCUS environment you are accessing does not use default settings or components require authentication, click the appropriate button in the top pane to provide parameters. The sections that follow explain the parameters available for each component. Note: WebFOCUS environment properties must be entered in a specific order. For example, if web server security is enabled, you cannot set the WebFOCUS Client Path until you have provided valid web server credentials. Similarly, you cannot retrieve a list of Reporting Servers until you have provided a valid WebFOCUS Client Path. As you select a component button in the dialog box, Developer Studio ensures that it has the necessary information before it displays the properties of that component in the lower part of the dialog box. If the required information is not available, you will not be able to proceed to the next component or save the environment. Local Machine properties are optional. You can select the Local Machine button to indicate whether to cache files when accessing a WebFOCUS environment. The following image shows the WebFOCUS Environment Caching section of the WebFOCUS Environment Properties dialog box. In caching, copies of files or information stored on a remote machine are temporarily stored on your local Developer Studio machine. Developer Studio then works with the locally stored files. Caching speeds Developer Studio performance because remote machines are not accessed and queried every time you request information. This is especially useful when accessing mainframes or when a network connection is slow. However, caching should not be used when multiple developers are working with the same files because the possibility exists that one developer may overwrite the changes of the other. By default, caching is not enabled. Cache remote directory and file information. This option caches information about files stored on the WebFOCUS environment. This does not actually cache files, only information about them. If selected, Developer Studio does not re-query the Reporting Server every time it needs a list of files stored on the server. Enable file content caching. This option caches files normally stored on the server. Developer Studio only retrieves files once and then when you wish to read or edit them, it uses a cached copy. Be aware that when you edit a cached file, the edited cached file is returned to the server and replaces the actual file on the server. Developer Studio retrieves information and files the first time you request them and then caches them locally. Developer Studio then uses the cached copies until Developer Studio is restarted or you click the Clear buttons for each level. You can perform a manual refresh and clear all cache files by clicking View, then Refresh, or by pressing F5. Refresh is performed for the area that is selected in the Explorer when you perform this action. If you create a new synonym, you must manually perform a refresh to view the new files in the Developer Studio Explorer when caching is enabled. You cannot use the caching options for the local development environment if the Source Control feature is enabled. The Web Components button is selected by default when you create a new environment or edit an existing one. Web Component properties specify how Developer Studio accesses the web server. The web server must be identified before any other components. The following image shows the Web Server section of the WebFOCUS Environment Properties dialog box. Host Name/IP Address. This specifies the host name or IP address where your web server is running. This field is required and will not default. For a network installation, ensure this is the actual host name and not localhost. Protocol. This is the protocol to use for accessing the web server. Port. This is the TCP/IP port for accessing the web server and it defaults to 8080. HTML Alias. This is the alias defined on the web server for the ibi_apps/ibi_html directory of the environment. If your WebFOCUS environment does not use the default ibi_apps/ibi_html alias, specify the custom alias defined on the remote web server. Developer Studio must know this alias to retrieve key information from WebFOCUS. To validate connection to WebFOCUS and determine other necessary information for the environment we are connecting to, such as web application name and release information. Use Default. This specifies whether to use the default ibi_apps/ibi_html alias. Leave this checked unless you change the HTML Alias. Connection timeout. The default time to connect to a WebFOCUS environment is 10 seconds. However, in some slow systems this needs to be increased to avoid connection failures when the timeout period is reached. If timeout issues are experienced, please increase this to 240 or higher. Also, increasing the timeout can address issues with slow environments or environments that have many resources (Applications/files) during development. Web Component Authentication. This is used when authentication is required on the web server. To set security, select the available security from the drop-down list and type a web server User ID and Password and other settings depending on the authentication being used. If this is set to None, the web server must allow anonymous access. For more information, see the WebFOCUS Security and Administration manual. When you click the WebFOCUS Client button, Developer Studio makes a connection to your web server to retrieve information about the WebFOCUS environment. Therefore, you must first specify Web Component properties and your web server must be running. The following image shows the WebFOCUS Client section of the WebFOCUS Environment Properties dialog box. Note: If the Client Path field is empty and the Use Default option is selected, there is a problem connecting to the WebFOCUS Client. Ensure your web server is started and that you typed the correct properties on the Web Components page. If you cannot connect, contact your WebFOCUS administrator. If the WebFOCUS environment uses a non-default context path, Developer Studio should be able to detect the custom context path that is used. If it does not display properly, uncheck the Use Default option and enter the correct name. If the Client Path is incorrect for the environment, you receive an error that the WebFOCUS Client cannot get accessed using the provided Client Path. If you do not know your path, ask your WebFOCUS administrator or check the WebFOCUS Administration Console of the environment to which you want to connect. The Client Path settings for the environment are located under Utilities and Client Selection. Select Language. This specifies the GUI language that is used when Developer Studio connects to a remote utility (Managed Reporting, HTML tools). When a multi-language master file is used, this setting specifies the language titles in reports. Supply Credentials. You can check this box and type a WebFOCUS User ID and Password. These credentials will be used for future connections to the WebFOCUS environment. When the correct WebFOCUS Client Path is provided, you can specify properties for the remaining component. This option is enabled only when connecting to a WebFOCUS 7.x environment. If you plan to work with Managed Reporting (MR) and/or ReportCaster, you can optionally select the Managed Reporting/ReportCaster button. This allows you to set logon credentials or change the default Managed Reporting repository. The following image shows the Managed Reporting Repository section of the WebFOCUS Environment Properties dialog box. You will not see a value in this field when Use Default is checked, because it is not currently possible for WebFOCUS to detect the list of potential repositories on the web server. Note: ReportCaster only supports the Managed Reporting Repository as defined in the WebFOCUS Client Configuration file MR_BASE_DIR. Supply Credentials. If required, you can check this box and type a Managed Reporting/ReportCaster logon. Developer Studio will automatically use this logon each time it accesses Managed Reporting or ReportCaster. If this is blank, Developer Studio prompts you for the logon when it requires access to Managed Reporting or ReportCaster. Note: If your WebFOCUS administrator has integrated MR authentication with web server authentication, do not supply MR credentials here. They will be picked up from the web server component properties. This object allows you to see Reporting Servers that are configured with the working WebFOCUS environment. This information is secure and users will be prompted to sign in to WebFOCUS in order to access this information. From this area, you can add a user Id/password to be used when connecting to a specific Reporting Server. The following image shows the WebFOCUS Data Servers section of the WebFOCUS Environment Properties dialog box. Supply Credentials. If checked, you can type a WebFOCUS Server ID and password for the server highlighted in the list. 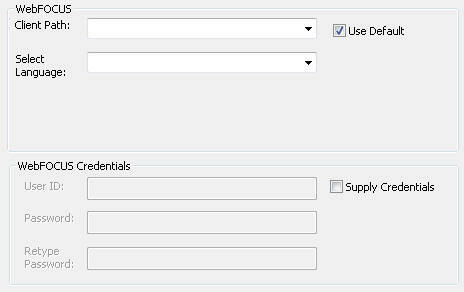 Clicking Set stores the credentials with the environment properties, and the ID entered is shown next to the server in the list. The credentials are checked the next time you use a feature on that server, not when you click the Set button. Note: These properties only apply to self-service application development, and when performing project development. This object allows you to see Reporting Servers that are configured with the working WebFOCUS environment. This information is secure and users will be prompted to sign in to WebFOCUS in order to access this information. If you use remote Project-based development and your remote environment has multiple WebFOCUS Reporting Servers, click the Project Development button to specify which server to use when processing requests. This server is referred to as the Project Development Server. The Project Development Server and the WebFOCUS Client must be installed on the same machine or use the same Application Root directory (APPROOT directory) as each other. The following image shows the Project Development Server section of the WebFOCUS Environment Properties dialog box. Project Development Server. This specifies which server to use for Project Development. All servers defined in the WebFOCUS Client appear in the drop-down list. To use remote Project-based development, you must change the development environment. If you do not plan to use remote Project-based development, you can skip this procedure. After you set up connections to WebFOCUS environments, you can add, edit, and delete files on remote machines through the WebFOCUS Environments folders. However, you may want to use the organizational tools available in the Projects folders to manage applications on remote machines. This is known as remote Project-based development and it allows developers on different desktops to share files and work on the same application. Remote Project-based development requires that all WebFOCUS components in the remote environment reside on the same machine as each other or if installed on different machines, they have the required configuration to allow Project development. For Project development, the remote WebFOCUS environment must have the same Application Root directory (APPROOT directory) for its WebFOCUS Reporting Server and WebFOCUS Client. You can change the development environment using the Environments List. Select File and then Show Environments to bring up the Environments List, as shown in the following image. Note: If an environment appears as unavailable, click Refresh Status. Select the WebFOCUS Environment that you wish to use for Project-based development. The Developer Studio Explorer now shows Projects on the WebFOCUS environment you chose. Resources will be stored on the remote machine. If multiple Reporting Servers are defined, reports are run using the Reporting Server that is set for project development in this environment.